One blog that I have been following since my university days is Sophia's. She gives incredibly detailed and honest reviews. Ettusais is a brand that she has consistently raved about and after reading every single entry twice, I decided to jump on the bandwagon. I got myself the BB Mineral Cream and the BB Mineral Powder from the Bugis outlet (Splendid service, btw!). 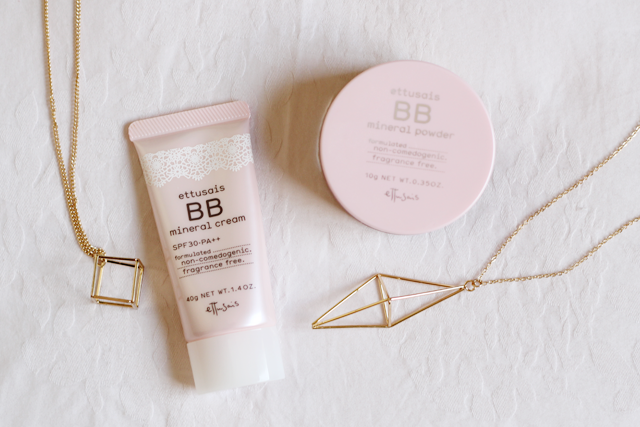 Made of 79% skincare ingredients, Ettusais's first lightweight BB cream spreads easily to hide pores, even out skin tone and control oil. Ingredients include Hyaluronic Acid and Glycerin and AC-Control Oil, which helps to prevent acne. It also contains SPF 30 PA ++. Made of 100% ultra-fine mineral powder, it provides coverage without thick application. It absorbs and removes excess sebum and creates a soft focus effect for baby-like skin. Ingredients include the award-winning Skin Roughness Preventing Powder, that, well, prevents skin roughness from occurring. I have been using this duo for more than 2 months, and I love it so much that I have been dragging friends to Ettusais counters and getting them to do some serious swatching. Heh. Just like what Ettusais says, this duo is so lightweight that it feels like I have got nothing on, yet my redness, uneven skin tone, yucky pores and even yuckier small blemishes are all cancelled out. Unfortunately, the large ones need a wee bit more help from the concealer (As seen above! ), but I don't usually bother (Also seen above. Haha.). I have this on from 6am till about 6pm and of course, some of it is has worn off, especially the T-zone area. But overall, my complexion still looks pretty flawless!